Amazing condo with mountain views, upgraded throughout, HDTV, gourmet kitchen, hot tub! This gorgeous condo is 2 levels, and approximately 3300 square feet in size. The entry level consists of the main living space with the kitchen, dining area and living room combined into a spacious great room. Also on this level are the den, the laundry room and a powder room. The hot tub is out back on the patio, which faces the 10th hole of the golf course. All 3 bedrooms are upstairs, as well as an office with wireless Internet access. Kitchen: Granite counters, gourmet appliances including 2 ovens, refrigerator and separate upright freezer, wet bar, large cooking island – everything you need for cooking meals. Second - King bed with adjoinging bathroom, TV/DVD. Located on main level. 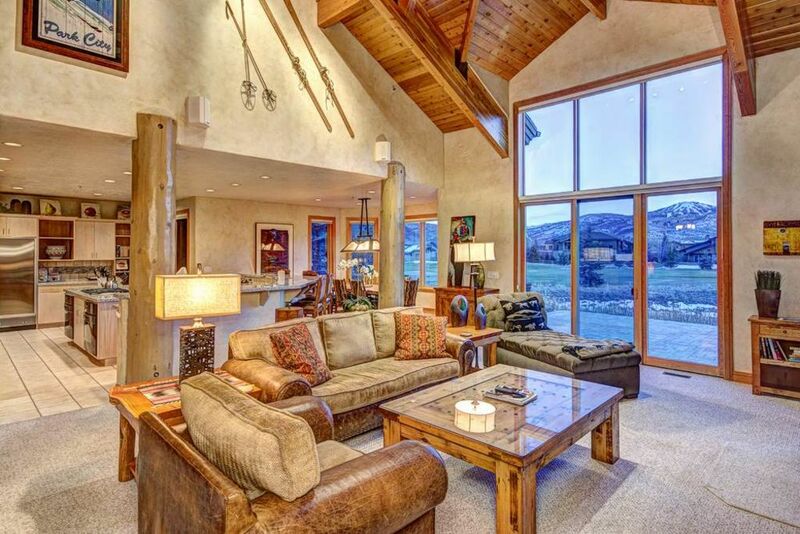 This condo is professionally managed by Alpine Ski Properties, Inc.
Park City, UT is the perfect ski location. With 3 major ski resorts within a 5 minute drive and an International Airport within 35 minutes there is simply no location as easy and convenient as Park City. A quiet, cozy location with great views of the surrounding mountains! You'll feel right at home in this gorgeous, remodeled condo! Another key feature of this property is that a professional property management firm manages it. Alpine Ski Properties has been providing lodging in the Park City area since 2003. We strive to make sure every guest has a fantastic stay and will work around the clock to ensure this. Don't get stuck with a VRBO owner that doesn't have any local contact in case something goes wrong during your stay. Alpine Ski Properties will make sure any problems are taken care of quickly and professionally, day or night. The place had not been cleaned and the kitchen was trashed. Dishes with food in the sink and on counters but management got it all cleaned and credited us a half day. Handled professionally with embarrassed apologies. The place was awesome from then on! There were a few maintenance things that needed attending to in the house but did not affect our stay. Hopefully they will be attended to for future guests. Overall it is a great place and location for families and groups to stay while in Park City! Beautiful home pictures do not do it justice. Kitchen stocked with everything you could need beds were very comfortable with lots of pillows and the view was breathtaking!! Quiet but only a few minutes drive from PCMR and old town! This place is very spacious and comfortable! Would stay here again!! house well designed and supplied. Great view. See rates list above or check live availability with the 'Book It' button!